My brother Colin was ‘in charge’ of our motorcycle trip plans for this year, and had booked accommodations for our first meet up point (Sandpoint, Idaho) and for several days in a time share unit near Reno. The plan was to meet on Saturday, June 13: he would leave Edmonton on Friday, and overnight somewhere along the way before meeting me in Sandpoint. That was the plan. But Colin ran into the kind of weather that Southern Alberta is famous for: the sort of weather where it is 30 degrees celsius and sunny at lunch, and 5 degrees celsius and hailing/snowing at dinner. In this instance, Colin ran into a hail storm of seemingly biblical proportions: accumulating something like three inches of sleet and ice on the highway in a matter of minutes. As he had decided to take a secondary highway with no shoulders or pullouts, he had no place to stop and wait for the storm to pass. So he pressed on… right through the adhesion limit of his motorcycle’s tires. Colin ended up with himself and his bike sliding on their sides down the highway, thus bringing his first day of riding to an unexpected and premature end. Thankfully Colin wasn’t hurt other than a bit of damage to his ankle: unfortunately the same could not be said for his Goldwing, which suffered a significant amount of front end damage. Fortunately, as it turned out, this damage was largely ‘cosmetic’ i.e. : the cowling, fairing, and mirror was damaged, but the frame and drive train were fine. But regardless Colin was off the road for an indefinite period. After making sure Colin was okay and that he had his bike in the shop, I had to make some decisions. Option #3, probably the least logical alternative, is the choice I picked. It got me back on the road almost immediately, and put me in charge of the arrangements so I didn’t have to bother trying to pick up and ‘re-create’ the details from Colin. Getting on the road quickly was probably the most important thing for me: before I had too much chance to dwell on the incident my brother had experienced. I’ve had a possible motorcycle road trip in the back of my mind for a couple of years now. Most of my rides have been “south”, which is fine. But it bothered me that I had lived in British Columbia for nearly 15 years but had rarely gone North. In fact, the furthest north I had been in the province had been 100 Mile House, which is not very far at all. This “go north” trip was what came together almost immediately in my mind when the trip to Reno hit the skids. How far north in the province could I go? Well, at a minimum I wanted to go to the start of the Alaska Highway. I started looking at some maps and reading about other people’s road trips, and realized that there was a good ‘loop’ of sorts that would get me as far north n the province as I could get. I roughed out a route to Watson Lake, Yukon, and forming a loop so I wouldn’t simply be repeating the roads on the return trip. I then found that the route I had picked even had a name: the Great Northern Circle Route. Starting from my home, this loop would involve something around 4,000 km of riding, which made it seem about right for my annual road trip. I set out in this new route one day later than originally planned. I arranged with Colin to stay in touch to see if there would be any logical place for us to bring our trips back together again if and when he got his bike back on the road. Setting aside misgivings and uncertainties, I fired up my Road Glide on Sunday, June 14, and pointed her North… well, East first, then North. My mental image of Northern B.C. was based on what I had seen approaching 100 Mile House on previous trips. That is: I expected increasingly flat, muskeg-boggy, bug swarming territory and a noticeable absence of mountains. I was wrong: of course I was wrong! Northern B.C. covers a huge expanse of territory, spanning plains, foothills, and mountains. Some of the scenery was as beautiful as anything I’ve seen elsewhere: I’m a big fan of mountains, so when I say ‘beautiful’ I generally mean ‘mountainous’ 😉 I kept trying to compare what I was seeing to other locations; the mountains south-west of Dawson Creek, for example, remind me of Jasper Park and the Icefields Highway. I’m afraid I didn’t appreciate the scenery as much when I was southbound on Highway 37. I might have enjoyed it more if it wasn’t cold and raining during my return trip, and if I wasn’t experiencing a bad cold at the time. More on that, later. But I also think Highway 37 is less scenic than Highway 97. It is also a lot more isolated. Almost all of the roadside wildlife encounters I had occurred during a single day. On Wednesday June 17, I saw 3 black bears, five bison, half a dozen moose, and many Stone sheep while riding between Fort Nelson and Watson Lake. During the rest of my trip, I only saw a couple of deer, and a couple black bears. I should perhaps clarify that these animals were ones I saw while actually riding my motorcycle. For example, one bear was at the side of the road as I approached: as I slowed down to a near stop, he decided to cross the road in front of me, perhaps 200 metres away. So every critter met both my bike and me. One thing I’ve often debated is the best method for dealing with wildlife I meet on the road. Slow down, obviously. But stopping completely seems like a bad idea when the animals in question often out-mass my motorcycle. I had one bison, for example, that crossed the road in front of me, then turned and started running towards me along the side of the road. Because I was still in motion (albeit slowly), I rolled on the throttle and got out of there before he closed with me. It seems to me that, if I was at a full stop, I’d be giving up the chance to get out of Dodge quickly- but that may not be actual wisdom. I like being closer to the animals than I am in a car… but it is an entirely different view when there is nothing between you and them but your riding gear. One female moose in particular made me aware of how vulnerable I am on a bike, even though we never got closer than a hundred metres or so apart. Regardless, it is a strange and lovely feeling to be that close. The northern route I took is at times pretty isolated. There are parts of the trip, particularly on Highway 37, where the distance between gas stations (let alone towns) is 250 kilometres. Cell service is non-existent except right near each town. And if you pull over and stop, it can be several minutes before another vehicle passes by. I found I enjoyed this sense of isolation. However, I had taken some steps to make sure technology was at my side even when cell service was failing. I had purchased and activated a Delorme Inreach SE before I set out. This meant that my wife Irene could keep track of me and, should an emergency occur, I could contact someone even from the most isolated location. This probably contributed to my sense of comfort even when ‘cut off’ from my usual technologies. Being away from things, even when the definition of “away” still includes cell and internet service at major stops, meant that I could refocus my mind a bit. I don’t know whether I’d want to live up north, but it was an intriguing sensation. My bike failed me just as I got North of Quesnel and before I arrived in Prince George. It had been raining, so when I started feeling an odd tapping at my left foot my assumption was that my riding gear had developed a defect. I set the issue aside to look at later when I stopped. A few minutes later I was coming up on another vehicle and was going to gear down, but my shift lever wasn’t where it was supposed to be. It is difficult and more than a little reckless to look at your feet while riding, but it is also incredibly challenging to ride with no mechanism to shift gears, so I risked a quick glance down. This showed me that the shifter was in a truly odd position, and it continued to be non-functional. I applied my brakes, pulled in the clutch, and hit the kill switch to keep the engine from over-revving. The problem became immediately apparent once I had stopped: the shift linkage on my bike had fallen off. On Harleys, this linkage is a ball and socket affair: a metal rod with sockets at each end, attaching to a ball on the shift lever and a similar ball on the shift actuator on the transmission. The socket had popped off the ball on the shift lever end, so I popped it back on. It was loose, but I didn’t know what else to do: I hoped it would hold together long enough to get to Prince George, and set off again. My “pop it back on and hope” fix lasted about two minutes. The linkage popped off again after my first shift, and once again I was rolling to a stop at the side of the road. Thankfully the rain had mostly stopped by this time. I decided it was time to bring out my ultimate weapon- duct tape. A bit of duct tape on the ball would add some friction, and then a longer piece covering the ball-socket joint would hold the two together: at least that was my theory. Amazingly, it worked, or at least worked well enough to last me the final 100 km into Prince George. I was fortunate to discover that Prince George is home to a Harley Davidson dealer. They were able to fit me in for service first thing the following morning, and I was back on the road an hour or so later with a proper non-duct tape fix. 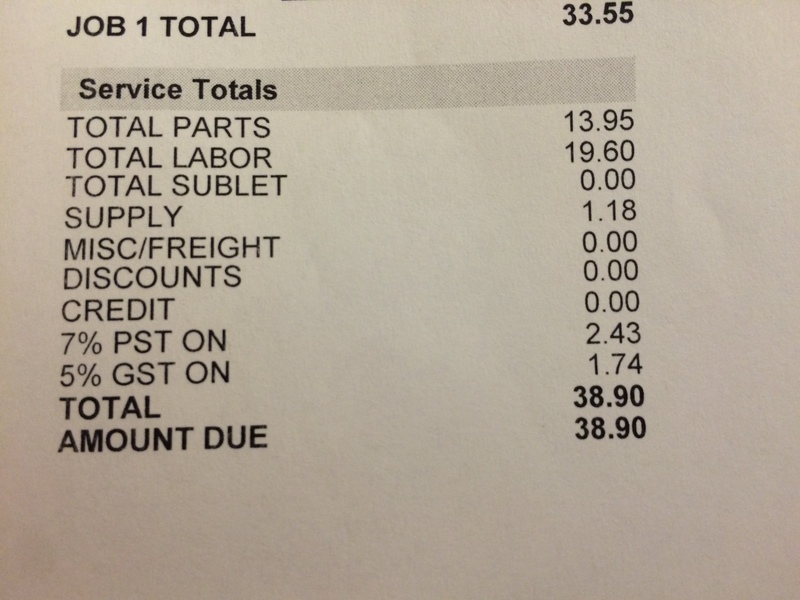 Amazingly, this repair actually cost less than $50: I could hardly believe my eyes… especially since I had spent nearly $2,000 a couple of weeks earlier supposedly getting my bike serviced and ready for the trip. I discovered that the rumours of the North being cooler than the South are, in fact, at least somewhat truthful. I experienced several days during my ride of cold, rainy weather, with temperatures not even reaching double digits. At first this was an interesting experience, something of a break from the warm summer we enjoyed at home. But by the time I reached Watson Lake I was starting to feel the effects of this frigid and wet weather. First it was just being uncomfortable. I miscalculated during my ride from Dawson Creek to Fort Nelson on day three of my trip, riding for several hours without putting on my rain gear pants. This resulted in me experiencing several hours of water-filled boots and freezing feet. I literally was able to pour water out of my boots when I stopped- this is what happens when you have completely waterproof boots, and the water is pouring down your legs directly into each boot. I am confident that it was this stupidity on my part that resulted in my second discomfort: catching a head cold. Head colds are never fun. By the end of day four of my ride, as I arrived in Watson Lake, Yukon, I was starting to feel a bit of a sore throat. The next day started out with rain, and temperatures again dropped to below ten degrees. It rained intermittently throughout the day as I started riding south on Highway 37. At least I had learned the lesson about wearing my rain gear pants, but the damage had already been done. I was overwhelmingly sick when I finally arrived at Bell 2 Lodge at the end of day five of my ride: running a fever, chilled to the bone, weak, and desperate to lie down. The next morning was when I made my second big mistake. I awoke to heavy rain, the temperature was barely above five degrees, and I was if anything even sicker than the night before. Despite this, I decided to get back on my motorbike and push on to Smithers, B.C. This was stupid on all sorts of levels. First, riding a motorbike requires full attention, quick reflexes, and some degree of strength. I had none of those things that Friday morning. I was weak as a kitten, wobbly on my feet, running a fever… the last thing I should have done was get on my motorcycle. But I thought I was still meeting my brother Colin in Smithers at this point. I was almost totally disconnected at the Bell 2 Lodge, though: no phone in my room, no cell service, and internet services were $10 for 30 minutes of access. I had sent Colin an email letting him know where I was and that I planned to meet him in Smithers, but I had no way of knowing that he had already changed his plans and wasn’t going to be there. Second, the weather was actually worse. The intermittent rains had become heavy and non-stop, and the temperatures had actually dropped another couple of degrees. I never saw the outside temperature gauge on my bike get above five degrees that entire day until I arrived in Smithers itself. The rain was so heavy and it was so cold that the visor on my helmet almost immediately fogged over when I started out that day. I was riding in mist and rain as it was, and losing visibility through my visor made things extremely dangerous. But by the time I realized this, I was already on my way: there was nothing really between the Bell 2 Lodge and Smithers to stop for the day at, so my only real choice once I started was to keep going. At least that’s what my somewhat befuddled, weary brain was telling me. So I flipped up my visor so I could see, which meant my face was immediately being pelted by 100 km/h rain at less than five degrees celsius. It was like being struck by non-stop icicles in the face: thankfully my face went partially numb after a while. Frankly, I have only vague and intermittent memories of the ride from Bell 2 Lodge to Smithers. I knew then and know even better now how big of a risk I was taking riding under those conditions. It was a stupid risk: what I should have done is hunkered down at Bell 2 Lodge, maybe found out if I could have gotten a better room with an actual phone and internet service (apparently their more expensive rooms have such luxuries), and tried to recover a bit from the cold. In the end I survived my ride from Bell 2 Lodge to Smithers on Friday… only to find out that Colin and Betty weren’t there after all. Colin’s ankle had started bothering him, so they decided to spend another night in Prince George instead. I was so sick and wobbly by the time I found this out that I wasn’t sure whether to laugh or cry. I decided the next morning to spend an extra night in Smithers so I could recover enough to make the last stage of my journey safer. Getting sick and the various delays associated with weather meant that, ultimately, Colin and I did not meet up. I told him to carry on without me: even after the extra night in Smithers, the only thing I really wanted to do was to get home and curl up in bed. Extending my trip into the U.S. with Colin had seemed like a good idea originally, but the reality of weather and viruses made it unattainable for me. I set out on Sunday feeling moderately more human, and with a simple target: make it home. The weather cleared off and warmed up, particularly as I continued South: even so, I made it only a far as Williams Lake on my first day back on the road. After Williams Lake I was in familiar territory, riding roads I’d ridden many times before. It was a rather relaxing ride that last day, and I needed that. I was still sick when I got home and even nearly a week later I’m still not fully recovered. Never trust a motorcycle service center to actually do all the work necessary to make your bike truly ready for a long trip.